Here we discuss the art of valuing antiques, including the signs to look out for when calculating antique values. Working out an antiques value involves a lot more than examining a price list, and antiques experts will only use a price guide as the starting point in the antique appraisal and valuation process. There are a number other factors that need to be taken into consideration when valuing antiques, but despite this determining an antiques value is not as difficult as you might imagine. So, how much do you know about valuing antiques? If you are like most people, the answer to that question is probably along the lines of, not much. Firstly, you need to be aware that you cannot simply look up the value of an antique and automatically find a definitive price. 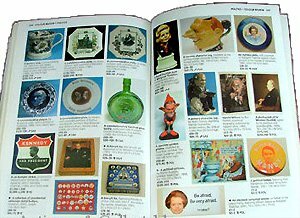 There are price guides and auction guides available, but antiques are almost always given a value within a certain range. For example, an antique Royal Worcester vase could be worth anything between $1000 and $30,000; but the actual value of any specific worcester vase will depend on a number of factors, including some of those outlined below. Antiques that have a manufacturer’s or designers mark will almost certainly have more value than those that do not, even if two pieces are almost exactly the same. These makers marks are often small, so you might need to use a magnifying glass to be able to see them. One of the reasons why many people often value their antiques at a lower price than it deserves, is because they either did not see the mark or they didn’t know to look for a makers mark. Also, if an antique has been hand painted, or hand crafted, there can be an accompanying artists signature added by the designer or artist. If the artists or designer is popular, this can add significant value. 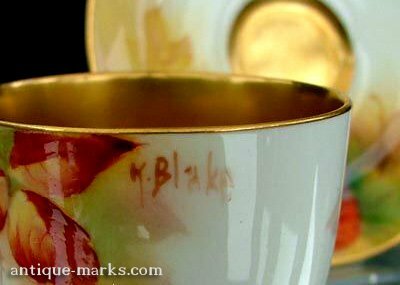 It is always a good idea to spend some quality time identifying any makers marks or artists signatures as they can greatly increase your antiques valaution. Condition … Alway assess your antiques condition with a critical eye. A considerable part of an antiques value will depend on its condition. This means including even small signs of wear and tear, such as chips, cracks and stains, as well as damage that is more considerable in your appraisal. And; while assessing the condition of your antique, keep a wary eye out for any signs that may indicate it is not a genuine antique, as this can drastically affect its valuation. If a rare antique has been restored by a professional, it can actually add value. However, the value will decrease dramatically if the repairs or restoration have been done by someone who does not have that expert touch. Very minor repairs may not affect the value that much, but it is always best to get a professional apprasiers opinion or see an antiques expert if you are at all unsure. If your antique is damaged, it is not automatically worthless, as antiques dealer will often buy pieces that they can repair themselves. Even antiques that appear to be severely damaged can still be worth something, but never assume the antiques value will be particularly high. You would be well advised to seek the advice of an antiques expert before you decide that a piece has no value, as you may just be pleasantly surprised. Antique values for relatively common or mass produced items will be relatively low. Likewise, if an antique is very rare, a one-off design, a trial piece or possibly made for exhibition, it will increase in value. A rare antique can command a high valuation even if it isn’t in the best condition. However, if you own a mass produced antique item that is in good condition, it will probably not be worth a huge amount. For the most part, it is the rarer, less common antiques that are worth the most, whatever their condition. Just because it’s an antique, does not necessarily mean that is in high demand. Antiques like most consumables tend to come in and out of fashion. A lot of the time, an antique item only becomes highly sought after if it becomes rare or the maker / designer becomes fashionable. For example; Troika Pottery was highly sought after in the 2002 to 2010 period but antique values dropped considerably once the financial crisis hit. Moorcroft pottery has suffered the same fate, unless the piece is very rare and in excellent condition. Antique Furniture also has its fads and fashions, including antique clocks that can be the mainstay of many antique dealers. Antique dark wood furniture doesn’t really fit with todays fashion for light, airy, minimalist interiors, and longcase clocks, along with everyday oak and dark mahogany furniture pieces have seen significant drops in antique valuations. 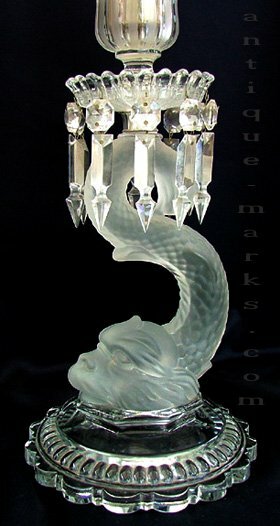 On the other hand, Art Deco pieces have risen in popularity due to their clean lines, quality and interesting geometric designs. And; genuine art deco jewellery remains popular despite the increasing popularity of newer pieces from the 60’s and 70’s. Antique Fakes & Forgeries are quite common, especially where high antique values and popular or highly collectable items are involved. Normally it is safe to say that the presence of a makers mark or artist’s signature will confirm your antique is likely to be real. But, knowing the major manufacturers antique marks and having a working knowledge of silver hallmarks means you will be less likely to accidently buy or sell a good reproduction or a genuine forgery. If the antique you’re appraising looks too new, with few indications of ageing or other wear and tear, it could be a good idea to keep a very open mind. Antiques should be over 100 years old and a lack of wear & tear can be a sign that it is a fake or forgery. Many of the signs that you should be looking for cannot be seen with the naked eye alone, which is why many professionals use black light testing to confirm authenticity.For porcelain, this involves taking the item into a dark room, and using an ultra-violet light to look for restoration, cracks, chips and similar damage. This only takes a minute, but it can have a drastic affect on how much your antique is worth. 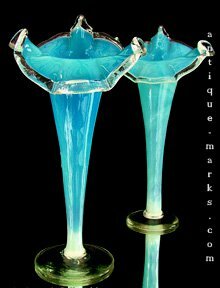 Green American Depression glass and Vaseline glass both glow when held under a black light, whilst colorless pressed glass tends to produce a yellow glow. In all of these cases, modern materials used in reproductions will not emit the same glow. Modern paint also glows when held under ultraviolet light, so it is not difficult to check most paintings for damage, cracks and touch-ups. Most paper documents that date from before the 1930’s will not emit a glow under ultraviolet light. However, most modern documents will (as a result of the chemical bleach and dye that is used), which means this can be a good test of authenticity. Many modern clothing fibers glow under black light, but do not assume that a material is old (or vice versa), just because it is doesn’t glow. Modern laundry detergents can cause old fabrics to glow under black light, because of the chemicals that are used in the production process. In this case, manufacturing techniques and design styles, should also be factored in when dating textiles. Only a fool will rely solely on online price guides to work out antique values. Online price guides can be a good indication of how much an antique piece is worth, but it should never be your sole resource when determining antique values. The information contained in price and auction guides is not necessarily an accurate reflection of current market trends, so it does not tell you how much your piece might be worth today. In addition, price guides rarely take into account other factors that will affect the antique values for specific individual antiques, such as its condition, and whether the piece has been professionally restored. Antique values tend to rise when demand is high, and this will probably be indicated in the price guide. However, the value will decrease once demand for the piece has declined, and this is unlikely to be indicated, which means it is all too easy to be fooled into thinking that your antique is worth more than current market trends say it is. But, valuing antiques doesn’t have to be the minefield many people believe it to be. With a bit of expert knowledge and a good reference, you can quickly become familiar with the signs you should look out for. If all else fails seek advice and a second opinion from an antiques expert on your antiques value.